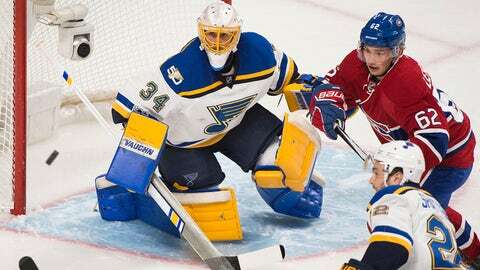 Jake Allen topped off his excellent week with a win over the Canadiens. ST. LOUIS — Credit the coaching change. The defense in front of him. His own work ethic and determination. A combination of all three. Whatever the reasons, Jake Allen is back. And the NHL has noticed. Allen, the Blues’ No. 1 goaltender, was named the NHL’s second star of last week. Allen, who had a dreadful January, opened February with a win in Mike Yeo’s first game as Blues head coach. And he won three of his next four starts, including all three last week, when he had a 1.00 goals-against average, a .967 save percentage and one shutout to propel the Blues to a perfect week and third place (29-22-5, 65 points) in the Central Division. He opened his week by posting his 13th career shutout with 30 saves in a 6-0 win at Ottawa. He then had 31 saves in a 2-1 overtime victory at Toronto, and 28 saves in a 4-2 win at Montreal. He is 4-1-0 under Yeo and ranks second in the NHL overall in save percentage (.953) and third overall in goals-against average (1.40) during that span. Minnesota forward Jason Pomminville and Nashville forward Viktor Arvidsson were named the league’s first and third star, respectively.